While waiting from SM Supermarket’s personnel confirmation of the stocks for the Christmas Joys, my friends from iLearners brought me to Golden Cowrie for dinner. They highly recommend this restaurant and I simply obliged – who can resist good food, right? This Filipino cuisine restaurant has some really tasty dishes and I don’t feel guilty stuffing myself with these delicious foods. True to its Filipino theme you get to eat your food on a banana leaf and have unlimited serving of rice. We ordered some Calamares, Crispy Pata, Sizzling Tofu Sisig and Dinuguan. All of it are good but I especially enjoyed eating the Sizzling Tofu Sisig and Dinuguan. I’m very picky when it comes to Dinuguan but this Dinuguan from Golden Cowrie made me nod my head in approval. It’s so delicious! 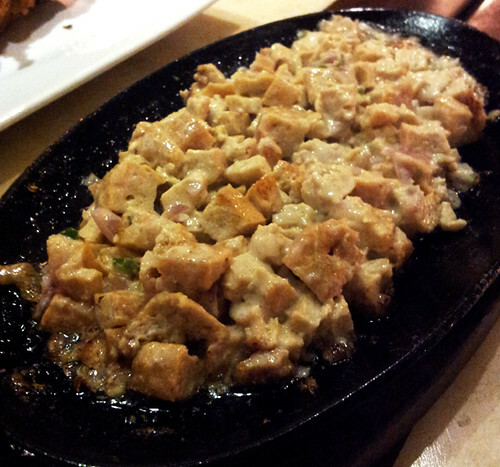 Sizzling Tofu Sisig. I never thought that you can make tofu taste this good! The crew were all friendly and accommodating. I’ve never seen such a happy bunch serving in a restaurant during peak hours. I was really surprised to look at the prices of their dishes. Comparing it to the overly commercialized restaurants in Metro Manila, the prices are a lot cheaper and it taste a lot better. Overall, I really enjoyed my dining experience in Golden Cowrie. How I wish they would have a branch in Metro Manila soon and maintain the same quality of their food and service.